There is a little corner of Chelsea that, for the moment at least, is for­ever France. Le Colombier on Dovehouse Streethas had a couple of incarnations in recent years. I think it was originally a pub called the Princess of Wales. Then Nicky Kerman, a great figure with the most magnificent silver belt buckle in the shape of a scallop shell, tried his hand at making it into a sort of north Chelsea riposte to Foxtrot Oscar He called it PoW (short for Princess of Wales). Now it is owned by Didier Garner, brother of the Bank’s Eric, and it has been transformed into something unashamedly French. 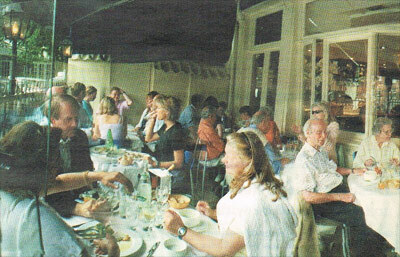 I daresay I was overcome by a viru­lent bout of Francophilia, but the sunny Saturday after­noon I decided to lunch en famille on Le Colombier’s terrace, I could have sworn that even the clatter of cut­lery sounded French. The scent of baked loup de mer filled the air and, as they didn’t say in Apocalypse Now, I love the smell of sea bass in the early afternoon. However, streetlamps apart, Le Colombier is chic and appealing in the manner of countless quayside restaurants from Menton to Marseilles. Chairs are aluminium. Sultry, chestnut-eyed waitresses do their best not to understand what you are saying. Rosé wine is drunk with a vigour and enthusiasm that reminds me of the time I got howling drunk with Amanda Wakeley at the Grand Hotel du Cap Ferrat. The woman in the Isadora Duncan-style scarf and shift dress on the next table does her best to impersonate Brigitte Bardot by allowing her poodle to eat at the table with her. The food is of the best French kind: simple, relatively inexpensive and well executed. This is the sort of place that is so brazenly French that it serves snails, rillette d’oie and soupe de poisson, and gets away with it. I am a salt cod nut. I could eat the stuff for days. I prefer the Italian version, in particular the baccala at Riva. But I have to say that the salt cod and mashed potato I was served at Le Colombier was lighter and tastier than that I enjoy at Brasserie Lipp: a place I am compelled to visit even if I’m in Paris only for the afternoon. By the time the crème brûlée arrived I was getting quite carried away with the overall Frenchness of my surroundings. A tanned Peter Mayle-alike in a red Ralph Lauren sweatshirt pushed up to below his elbows arrived on the next table. At the other end of the terrace there was a man giving a passable imitation of a corrupt Niçois businessman lunching his mistress, a woman in ludicrously overdecorated Tyrian pink pedal-pushers. The Monegasque touch of a pair of Rolls-Royces parked outside was not lost on me, nor was the French number­plate on the BMW parked strategically in front of the entrance. If I have one complaint it is that I was not made aware of the dress code. I was the only man not to have dressed as if on holiday.